Connections Public Charter School has a stable home now that a nonprofit organization has purchased the historic downtown H.S. Kress Building for the school's benefit. Community Based Educational Support Services-Friends of Connections closed the $2.2 million deal Wednesday in a move much anticipated at the school and among its supporters. "It's hard running a school and not knowing what will happen from year to year," said Connections CEO and Principal John Thatcher, who oversees about 335 students. "This is the best way for us to have stability and control. We also believe the downtown area is being revitalized. If someone else bought the building and raised the rent, we'd be stuck." Thatcher credited the Phoenix-based Raza Development Fund with brokering a much-needed loan that the school found would be hard to get in Hawaii, where charter schools are a relatively new thing. The Raza fund works to improve opportunities for Hispanic Americans. The nonprofit Community Based Educational Support Services-Friends of Connections was started on Maui by former Connections CEO Tom Helm. Thatcher said the purchase is more for stability than growth. The school would like to stabilize enrollment at 340 to 350 students, just a handful more than the current number. Growing too big would defeat the whole point of a charter school, he said, which is to provide smaller classes, more teacher attention and a stronger sense of community. A former regular public school educator, Thatcher believes community and service is hard to build at Hawaii's large schools. "We really don't want to get too big," Thatcher said. "Research shows that big schools have a hard time serving kids. At Connections, I know most of the parents and as a principal, I'm there to greet the kids in the morning. We're trying to bring community back to schools. I think a lot of kids feel disconnected from schools." But staying small doesn't rule out the possibility of some expansion projects in Connections' future, including a campus to house high school kids who now use facilities at Nani Mau Gardens. "We're looking at expanding and getting some land in the next couple of years to build a high school campus," Thatcher said. "If we want to build later on, we'll probably have equity in this building pretty fast." Connections had a waiting list of 100 kids at the beginning of the school year. It employs about 45, including 24 full-time teachers. The school moved into the three-story, 46,000-square-foot H.S. Kress Building in 2001 and has been trying to buy the building since then. Thatcher said the school was happy to be able to work with the former owners, the family of Hawaii's former U.S. Sen. Hiram Fong, who died in 2004. "The family was very good about keeping the cost down," Thatcher said. The state will not allow a charter school to own its own building, so Connections went through the nonprofit, which will lease the building to the school, Thatcher said. "It feels better to rent from your uncle, someone with whom you have a close relationship, rather than seeing rent money vanish from month to month," said Thatcher. 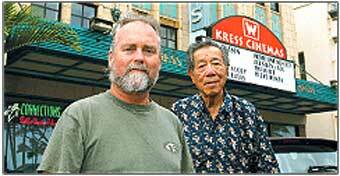 The Kress Building on Kamehameha Avenue also houses the Kress Cinemas and the Tropical Dreams Ice Cream parlor. Leases for the businesses will not change under the new arrangement, Thatcher said. Built in 1932, the art deco-style building featured a five-and-dime store and fountain for almost five decades before those facilities closed in 1980. The building underwent a $2 million renovation in 1995. It holds four large classrooms on the first floor, seven on the second floor and a third-floor staff area. Connections started as a "school-within-a-school" in 1994 at Mountain View Elementary School. Established through the Coalition of Essential Schools' Small Schools Project and funded by a grant from the Bill & Melinda Gates Foundation, the Connections high school started new this year with 75 students. Struggling to pay teachers on a $3,000-per-student funding scenario in 2002, the Connections K-12 school now receives about $7,000 per pupil, Thatcher said. This is also the first year that the school has received facilities funding, which works out to about $700 per student. "Five years later, that's a lot better," Thatcher said. "Because we have had a governor and a legislature that supports charter schools, it has gotten better every year. I don't know if we're equal yet to regular public schools, but we're getting there." Bret Yager can be reached at byager@hawaiitribune-herald.com. All rights reserved. Copyright © 2006 Hawaii Tribune Herald. Content on this site may not be archived, retransmitted, saved in a database, or used for any commercial purpose without the express written permission of Hawaii Tribune Herald.